Since its inception in 1946, the Juneau Icefield Research Program (JIRP) has offered undergraduate and graduate students a unique research opportunity on the large system of temperate glaciers located north of Juneau, Alaska. 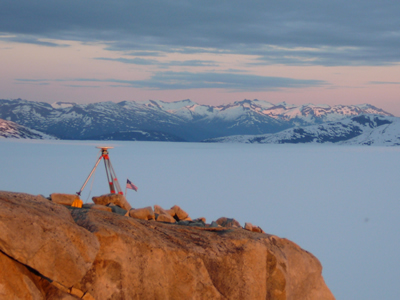 For the first time this year, UNAVCO provided GPS support to the program's yearly Real-Time Kinematic (RTK) and static surveying campaigns, which will generate data for those studies relating to glacial mass balance and glacial flux. For two months each summer for the past 60 years, the program has conducted long term research on interdisciplinary earth sciences, generating one of the largest and most complete collections of field data of the area. Students, staff, and faculty begin the experience in Juneau, and from there hike up to the first field camp, on the southern tip of the icefield. They then ski their way across the glacial network from camp to camp and eventually end the program in Atlin, BC, where each student presents the research they have conducted on the topic of their choice during their trek across the icefield. Field experiences and classroom studies are an integral part of the experience during the entire time. Most of the surveying conducted by the program pertains to measuring annual changes in glacial surface elevation and taking velocity measurements over a 10-day period, and therefore uses RTK. This year, the survey team was able to complete all of the major transverse and longitudinal profiles that are monitored on a yearly basis, and was hoping to create two new profiles along a few tributaries to the Taku Glacier, the main artery of the icefield. 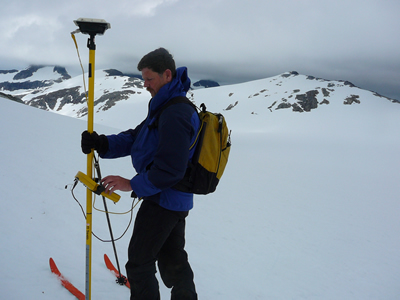 Figure 1 - Scott McGee, the program's head surveyor, measures the position of a point on the Lemon Glacier. Figure 2 - The GPS base station at Camp 10, which sits on a nunatak in the middle of the Icefield, overlooks the Taku Glacier and the mountains beyond.